I am an Assistant Professor in Mechanical Engineering working on legged robots, adaptive controls, contact-rich manipulation, physics based planning & learning, and terrain manipulation as director of the Robomechanics Lab. My postdoc involved developing new manipulation planning algorithms on HERB in the Personal Robotics Lab, part of the Robotics Institute at Carnegie Mellon University. I earned my PhD working on self-manipulation and dynamic behaviors on legged robots (among other things) in Kod*lab, part of the GRASP Lab at the University of Pennsylvania. Before that I was an undergraduate student researching snake robots as part of the Biorobotics Lab, also at Carnegie Mellon University. 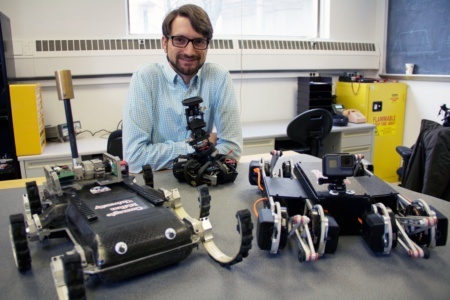 My research aims to design intelligent interactions between a robot and its environment. Thus far robots have been most successful in highly controlled environments such as factories designed around the limitations of the robot, or for extremely simple behaviors such as vacuuming flat floors without too many obstacles. But we need robots that are capable of performing useful behaviors in real environments, like our homes and offices, that are cluttered, complex, and changing dynamically. The only way we will ever have robots that can explore the world or help us in our homes is to study this behavior interaction between the robot and the environment. Unfortunately these interactions cannot be controlled directly but rather they can be controlled only through the design of the platform, sensors, and software such that when the robot is run in a given environment, the desired behavioral interaction results. Robomechanics Lab - Information on my research group. Prospective Students - Interested in working with me? Find opportunities here. Locomotion Seminar - Subscribe to the CMU Locomotion Seminar group or look at the calendar. I am excited to announce that the lab has received two new grants to take robots out into challenging terrain! The first is a Young Investigator Award from the Army Research Office on climbing steep rocky hills. The second is a grant from company to explore and sample for environmental contaminants in soil around industrial sites. To help get these projects moving we are looking for a Postdoctoral Researcher interested in taking robots out into the field -- if you are interested please contact Prof. Johnson. At long last we have officially released our small open-source version of RHex called MiniRHex. We originally designed MiniRHex for the Engineering@CMU program for high school students so that we could bring a fleet of robots into the classroom and let students have more hands-on time than is possible with one or two larger robots. However, MiniRHex has also turned out to be a great research platform since it is much smaller and easier to work with than other robots while still having interesting dynamics and an impressive payload capacity. Check out our video and this article about the robot. At RSS I am hosting a workshop called Unusual Appendages: Novel, multi-modal, or multi-functional uses for limbs, tails, and other body parts . We have a great list of speakers and it should be an interesting discussion about different ways animals and robots use limbs. My second new class will start in Fall 2018, called 24-760 Special Topics: Robot Dynamics and Analysis. In this class students will learn modeling techniques for robots and other hybrid dynamical systems with a focus on contact conditions, friction, timestepping simulation, and contact invariant optimization. Students will write their own simulation and optimization code in Matlab in order to better understand the challenges and tradeoffs involved in modeling and analysis. Interview and overview of my current research in the Robomechanics Lab, featuring many of my current students. Summary of my spring class, 24-775 Robot Design & Experimentation, with student projects from 2018 available here. X-RHex Lite running, leaping, and doing backflips around Penn's campus, using behaviors first presented at ICRA 2013, and featured in several videos.